Embark on Star Trek’s 50th Anniversary in celebratory style with the Star Trek 50th Anniversary Kirk and Spock T-Shirt. 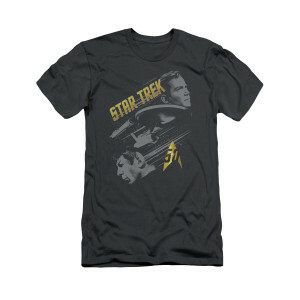 The soft charcoal t-shirt features Kirk and Spock along with the Enterprise traveling where no man has gone before. This t-shirt in your collection is the perfect identifier of a true fan. The Shirt looks great! I know my husband will love it! Great shirt, I've gotten many compliments on how cool it is.